Twitter is one cool place to be in! You can reach out to any celebrity or public figure by just mentioning their name with “@”. You can instantly connect and share your views, be a part of a massive public discussion and much more. It’s hard for Twitter to split down too hard without changing the very idea of the site. To this end, they’ve introduced various ways for users to take more control over who and what they see. You can mute several accounts, particular words, or even just retweets. Fortunately, one such delight is Twitter’s Quality filter which filters the low quality content from your account and allows you to focus on improved tweets. Let’s dig a lil deeper in detail! What Does Twitter’s Quality Filter do? As we said earlier the basic functionality of Twitter’s Quality filter is to refine the low quality content like duplicate tweets or automated content, and present you with high rated content instead. The Quality Filter does nothing to notifications “from individuals you follow or accounts with whom you frequently interact”. This implies that your friends will still be able to spam you with a same piece of message again and again unless Twitter stops them. It additionally means that in case you’re having a discussion with somebody who you don’t follow, Twitter isn’t going to stop their notifications from appearing. Thus, the quality filter is a fine blend of making your account private, blocking useless notifications and enables you to stick to the content that you actually wanna see. Select your profile picture icon on top right corner of the page and tap on “Settings and Privacy”. From the sidebar menu that pops up, select Notifications. Under Advanced section, check on the Quality Filter and select “Save Changes”. If you want to disable this feature anytime in near future, just un-check the Quality Filter box and click Save Changes. The Quality Filter feature was introduced by Twitter back in 2016 but not many of were aware about it. So, what are you waiting for? 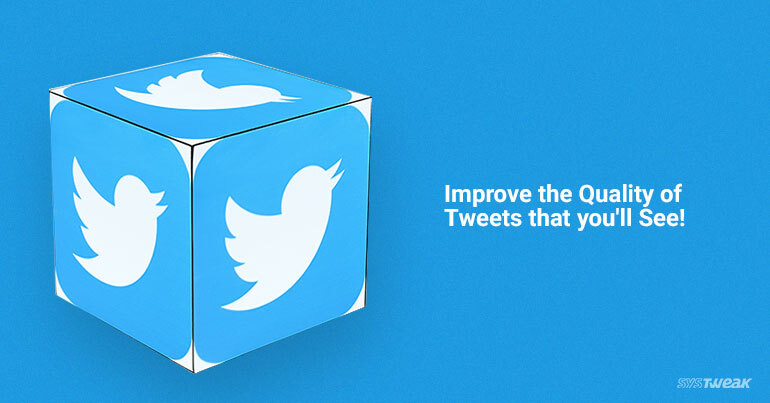 Now get rid of low quality tweets and let us know how it works out for you. Guess it’s now time to make your social experience a pleasant one! 5 Alternatives To YouTube You've Got To Check Out!